What follows is my own collection of parrot related links. Don't view this as a blanket endorsement, these are simply places I have enjoyed and wanted to be able to revisit. If you are curious about the pair of Military Macaws on the right, go read the amazing story of Rosie the Blind Macaw which I also have copy of here, in case the above link evaporates. It has been said many times that poor diet is one of the biggest health concerns for captive parrots. Here is a simple guideline: if you are feeding some kind of seed mix, you need to make drastic changes immediately. Once you join the group, take a look at their files and guides online. 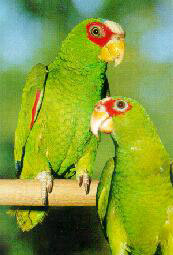 One of the best information resources on things pertaining to parrots is the magazine: The Companion Parrot Quarterly (previously the Pet Bird Report). This is edited by Sally Blanchard who has been working with (and writing about) Parrots for a long time. Let me just say this: I had a subscription to "Bird Talk" for a year or two after I got my first parrot, and with the exception of an article or two, I wouldn't hesitate to toss all those magazines. Now that I have discovered the Companion Parrot Quarterly, I have ordered two sets of back issues and you would be hard pressed to get me to part with any of them. If you are in the Tucson area (as I am), support the Tucson Avian Rescue Association: TARA. They offer a class in bird and parrot care, find homes for unwanted birds and can even help you to rescue and adopt a bird! There used to be a site online that called itself the Hagen Avicultural Research Institute. It had some interesting papers on avian nutrition, I found the following essay by Mark Hagen on Avian Nutrition there, long ago. Busy beaks offers a nice line of bird toys and other interesting and worthwhile products: Busy beaks. A lot to read, and bird food products to buy. Whitewings Farm. Roses pet Emporium offers nuts, food, toys, supplies, books, and comes with glowing recommendations. In Santa Barbara, California. Appendices I, II, III list species with various levels of legal protection. 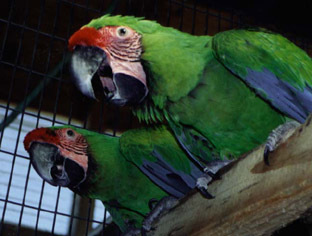 You should visit the Santa Barbara Bird Farm. Phoebe Linden has been a prolific writer, and as you look at her site, you will find that the farm is shifting away from bird production to new things. They are among the most highly regarded breeders in the country, so this is worth watching!